The victim was dragged down the street for 160 yards, or 145 meters, before he finally died. His death is symptomatic of the serious ethnic/class tensions in Inner Mongolia, where the crime took place. Li Lindong was Han Chinese; Mergen was an ethnic Mongol herder. Inner Mongolia covers over 10% of China’s landmass and has 24 million people. Han Chinese make up almost 80% of the population, but the ethnic Mongol minority were there first. 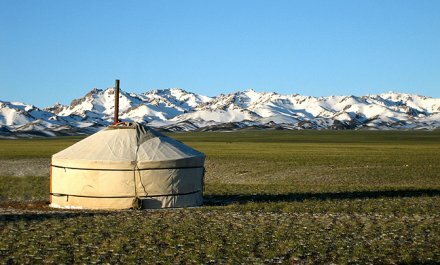 A yurt on the Mongolian steppe. While the Mongols continue to live a traditional, pastoral existence, the region’s coal industry has been booming of late and many Hans, like Li, have flocked in vast numbers to work in the mines. Problem: mining and sheep-herding don’t exactly go together. The noise from the mines is difficult to live with. The coal pollution is turning the steppe into desert, making it impossible for them to find pasture for their animals. The miners are intruding on their land, tearing up the grass and even running over and killing their livestock. The Chinese government is trying to force them to to give up their nomadic existence and live in permanent houses. Many students are from herding families who have been moved into cities as the wide-open pastures are fenced off. The government says such measures are necessary to promote development, prevent overgrazing and protect the fragile grasslands, much of which have turned to desert in recent years. Locals say herders’ rights have been violated and the fencing and mining have created bigger environmental problems, including pollution, noise, traffic and dust storms that blow across much of north-east Asia. The transformation is evident on the flight to Xilinhot. From the air, the grasslands are blotched with sandy areas near farms and the dark smudges of open-cast pits. From the road, the clouds of dust from mines and trucks is visible miles away. This was what lead to Mergen’s murder. Mergen’s murder lead to still more protests. 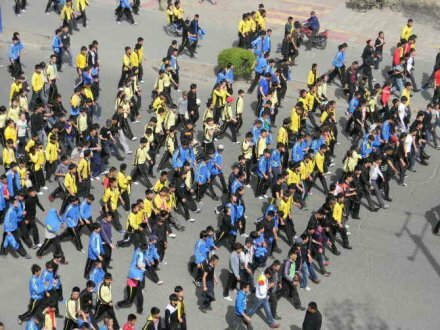 One, attended by some two thousand Mongolian high school students, was the largest protest in Inner Mongolia in twenty years. The protesters claimed the Chinese government hadn’t acted to address the underlying problems that lead to the herder’s death. A protest over Mergen’s death. As for Mergen’s murder, their response was swift, as Chinese justice tends to be. Mergen was killed on May 10. Li Lindong was arrested shortly thereafter and tried on June 8, in a six-hour procedure that resulted in the death sentence. That sentence was carried out two months later. Nor was he was the only person to face charges. Lu Xiangdong, the passenger in Li’s truck, was also convicted of murder and sentenced to life in prison. Wu Xiaowei and Li Manggang got three years apiece for obstructing justice by blocking the police cars that arrived on the scene and allowing the truckers to escape. The government also gave a monetary settlement to Mergen’s grieving family, but they would probably rather have him back instead. As for Inner Mongolia … it’s hanging in there, but it remains to be seen whether the environmental problems will or even can be relieved. * In his culture, there are no last names.